Early in our nearly eight year-old relationship, my husband and I cautiously began exploring Philadelphia’s food scene with our tiny bank accounts, his affinity for meat and my love affair with vegetarianism. We both had cheap rent and little overhead so we tended to eat and drink (and buy cute shoes) our way through our paychecks. We spent countless hours and dollars at Philadelphia’s hippest (read: Stephen Starr) and tastiest (read: Matyson) restaurants. When we heard about Django, this tiny little restaurant off of South Street that was causing quite a stir in the “foodie” (ugh, hate that word) community, we figured we’d check it out. Honestly, I don’t even remember what we had that night, but I remember the bread served in cute little clay flower pots and the (BYOB) wine in juice glasses. What could have been either kitsch or cute somehow managed to work. As the story goes, the married owners of Django, Aimee Olexy and Bryan Sikora, made the decision that they wanted to raise their young daughter in the countryside. To the disappointment of many, they sold Django and left the city. Shortly thereafter, they opened Talula’s Table in Kennet Square, PA. Talula’s Table is a gourmet food market with loads of artisanal items, charcuterie, a huge selection of fine cheeses, baked goods, frozen pastas, sausages and other items along with a nicely stocked deli cases with sandwiches, salads and more. Due to a non-compete clause, Olexy and Sikora were not allowed to open a restaurant within 40 miles from Django until 2009 and, as I understand, Talula’s Table lies just inside the line. Sikora did, however, get approval to cook in Talula’s kitchen and the dinners began. 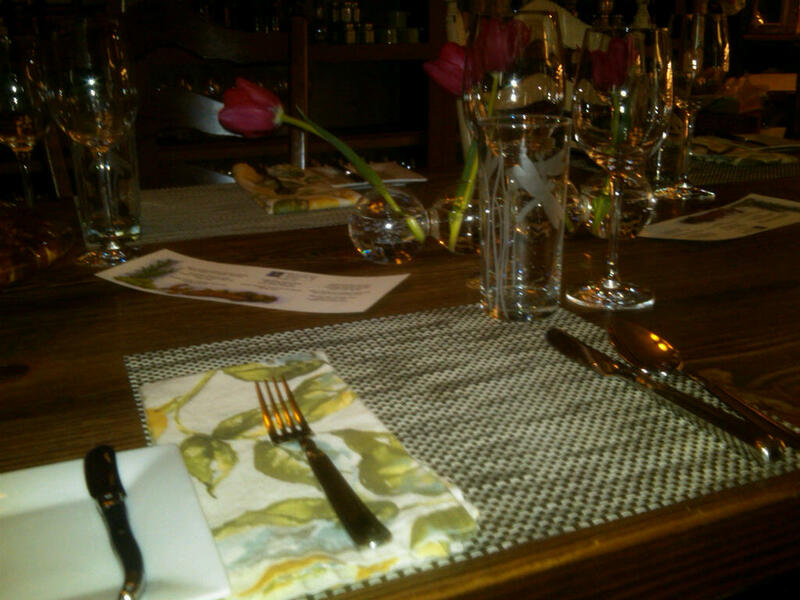 Soon after opening, Sikora and Olexy began offering a “farm table” dinner with one seating per night for 8-12 people. When Craig LaBan gave a glowingly effusive review (no bells though, because he only visited once and was not anonymous) that was just the beginning of a flurry of news from all over, including a 2008 piece in the New York Times. Suddenly, Talula’s table became the “most hard-to-get” reservation in the country. To get a reservation, prospective diners had to call at 7am ONE YEAR in advance. 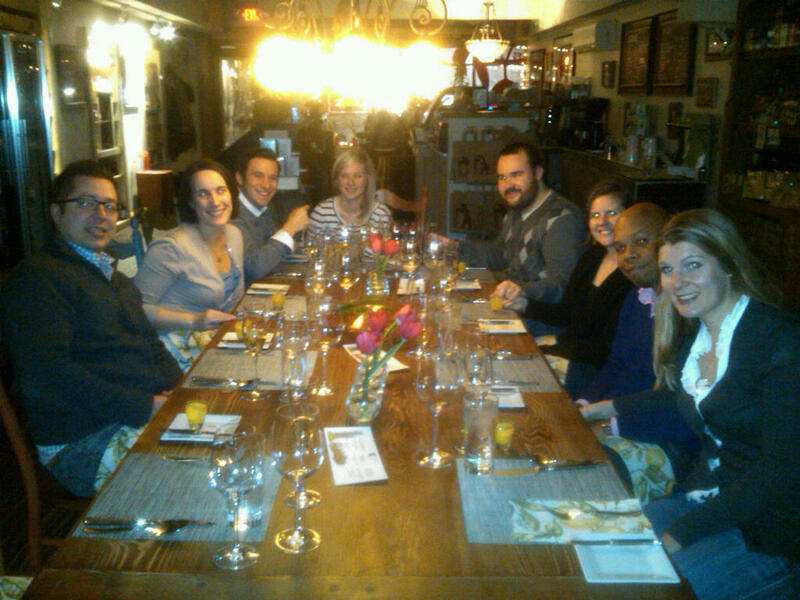 It was then that caller’s responsibility to fill a table of 8-12 people for the evening. At approximately $130 (including tax and gratuity) plus wine (they give proposed pairings to your menu to be purchased at Moore Brothers,) it was a much easier sell than one might imagine–due partially to the intrigue, I would imagine. Fast forward to a couple years ago. My best friend, Farish, learned of Talula’s Table. Farish is someone who is enamored by both good food and “hard to get” items like a reservation with such specific requirements. Farish and another friend, Suzanne, went to Talula’s to shop one day and, in chatting with the owner, were added to the “invite only” chef’s table list, a four-top that is actually in the kitchen. Those who are added to the list are contacted when a table is available and invited to come out. It tends to occur on shorter notice and she received a call one summer but we were all busy with work and vacations and were unable to commit. We never heard back afterwards and always intended to call. A couple of months ago, Farish and I were sitting on my couch discussing Talula’s Table and she mentioned that she was going to call them the following morning to make a reservation for late 2011. We took a peek at the website, just to check things out and learned that they had a cancellation for Wednesday, January 26th. The store was closed for the night, so Farish promised to call at 7am on the dot the following morning. Later the next day, I received an email from Farish–we were in! Thus the planning began. We solidified the guest list and waited patiently for the menu with suggested wine pairings. About a week before the dinner, Farish got the menu with suggested wine pairings and we planned to visit Moore Brothers to purchase the wines for the nine excited eaters. After an interesting trip to South Jersey (aren’t they all) and a GPS malfunction (for some reason, GPS’ place their address incorrectly) we made it to the store. Moore Brothers is like no wine store I’ve ever seen, especially as a resident of Pennsylvania with its parochial liquor laws. 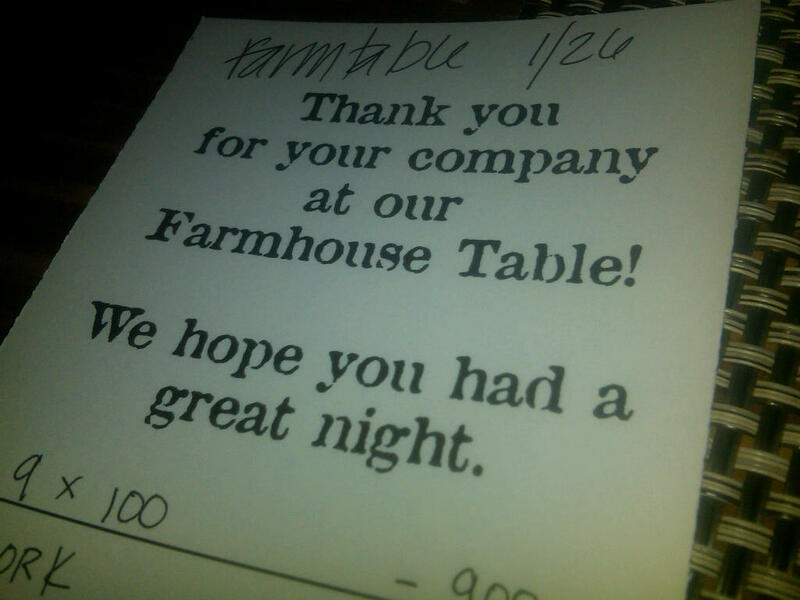 We were immediately assisted by a young and knowledgeable employee who took a look at our menu and pairings. We offered us a few suggestions, such as getting an extra bottle of the white Burgundy because he could see us sticking with that through the pheasant course. We ended up getting two bottles of each of their suggested pairings, with the exception of an additional bottle of white Burgundy and only one Moscatel. Farish and I left with some wine of our own, of course! I’m especially excited to try the Lambrusco as my husband and I drank many a bottle of the bubbly red in Emilia Romagna in May 2008 during our memorable trip to Northern Italy during which we got engaged. As our dinner date neared, the weather forecasts became more and more ominous. A flurry of emails kicked off on Tuesday night and by Wednesday we decided to book a hotel room in the area so we wouldn’t have to drive home during the height of the storm (and after nine bottles of wine!) I looked up local hotels on Yelp and found a Marriott which was apparently .5 miles from Talula’s Table. I booked two rooms–what’s a little more money at this point, anyway?–and we were all set to go! After typing the address into Google maps, however, I learned that it was more like a mile from Talula’s. No sweat, I figured we’d be so pumped from the dinner that a nice stroll back to the hotel would do us well. The nine of us left the city in three shifts–my husband and I were alone in our car and left around 4:15. The snow was supposed to start at 5pm and we figured we’d get a jump on the snow and evening rush hour. Well, the highway was a ghost town and we flew down 95 under a little rain but no sign of snow. Of course I had us take an absurdly roundabout route because I was worried about traffic and wanted to avoid Baltimore Pike, but we had plenty of time and the winding back roads were scenic and quiet. We even saw some sheep on the way out there. The conversation that ensued went a little bit like this. Me: Look at those things! Me: YEAH, are they REAL SHEEP??? Husband: I dunno, I guess. I am such a city girl. We finally made it to the hotel and checked in. The Marriott-owned Fairfield Inn was surprisingly nice and we got settled and waited for the rest of our friends. We decided that they would pick us up from the hotel and park in town. We would leave the car there overnight and we’d drive them to their car in the morning. We did notice that the route was not quite as walkable as we had envisioned–um, apparently there were no real sidewalks on Baltimore Pike. By the time they picked us up, just after 6pm, the snow was starting to come down pretty hard. We got to Talula’s around 6:30 and explored the store a bit. I bought my sister some treats for graciously agreeing to spend the night with our dog at the last minute. After wandering for a bit, we went next door to the pub for a beer while they finished preparations. At just after 7pm, we headed back to the store. Check it out in its snowy splendor. Once we made our way inside, we saw the single table set for nine. It was simple, yet elegant, with single red tulips in vases and beautiful crystal (I think?) stemware. 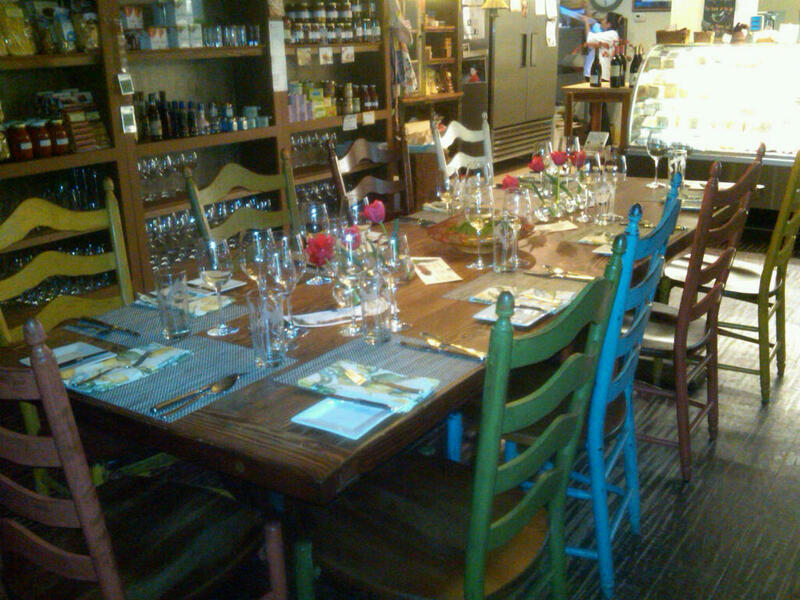 The were touches of the rustic nature of Django with different colored wooden chairs. As you can see, the table falls right in the middle of the store. The shelves are packed with dry goods on the side and the cheese case is at the far end of the table. We sat down excitedly and they popped our first bottle, a crisp and sparkling Bonhomme Cremant 2007. 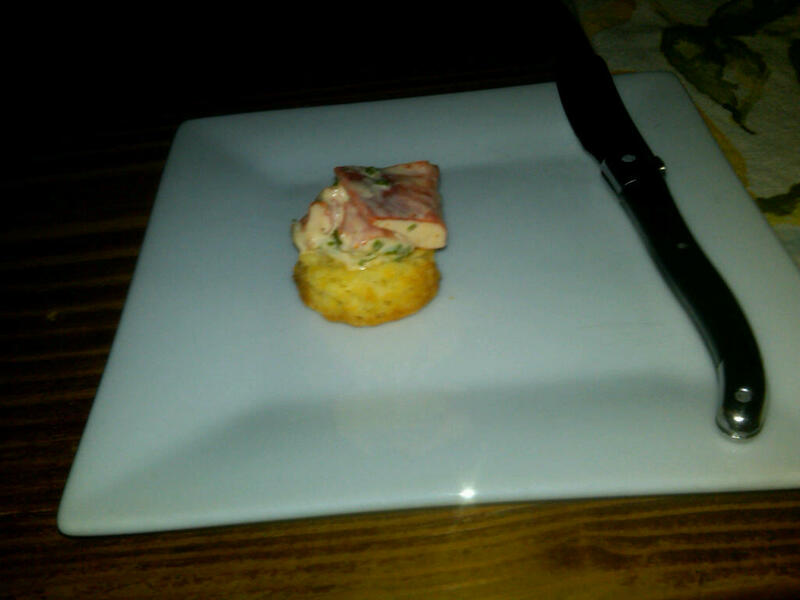 As we took our first sips, we were presented with one of three amuse bouches of the evening, lobster on a spicy biscuit. This was one of my favorite bites of the evening. Smooth and creamy lobster with the crumbly biscuit that packed a bit of a punch. Check out my place setting. And a close up of one of the few printed menus that were scattering the table. Around this time, I unsuccessfully called two taxicab companies in attempts to book a ride back to the hotel at 11pm. 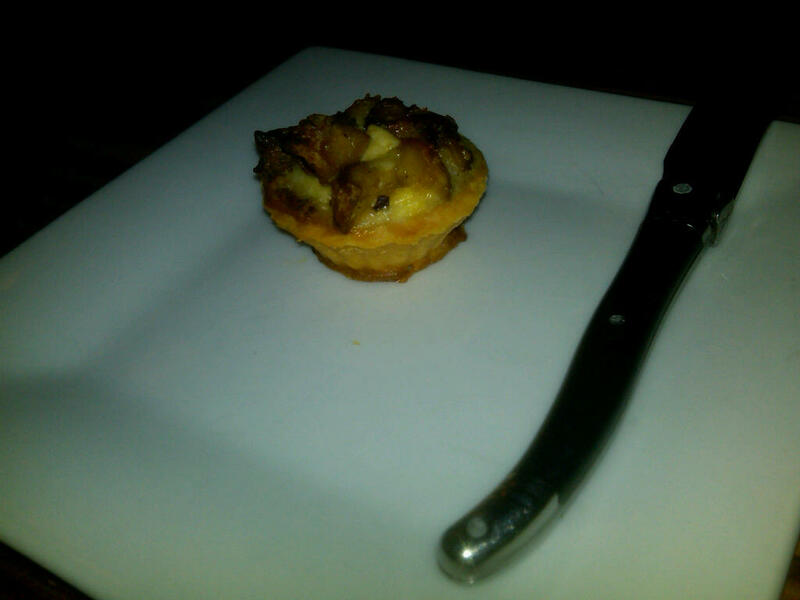 Next came a woodsy mushroom tartlette with rich, meaty chunks of mushroom and a buttery crust. 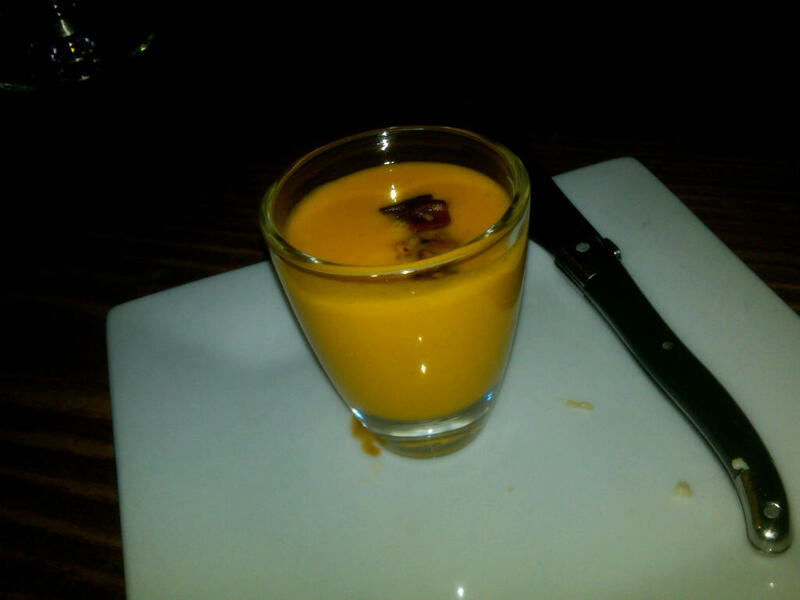 The third amuse bouche was a shot of butternut squash soup that tasted unlike any similar soup I’ve had in the past. It wasn’t quite as sweet and had a certain taste that I couldn’t quite put my finger (or taste buds) on but the savory nature of the dish really spoke to me. Even my husband, who does not generally like butternut squash, slurped it down with delight. For each of those three dishes, they brought them to the head of the table on a platter and proceeded to hand them out. I tried to grab a picture of her explaining them but I felt a little creepy so I figured I’d stick with the ones on my plate. The first course came out next. A Bisque of Hand-Harvested Maryland Shrimp, Shrimp Puppies, and Seafood “Andouille.” This velvety soup was a group favorite of the night. 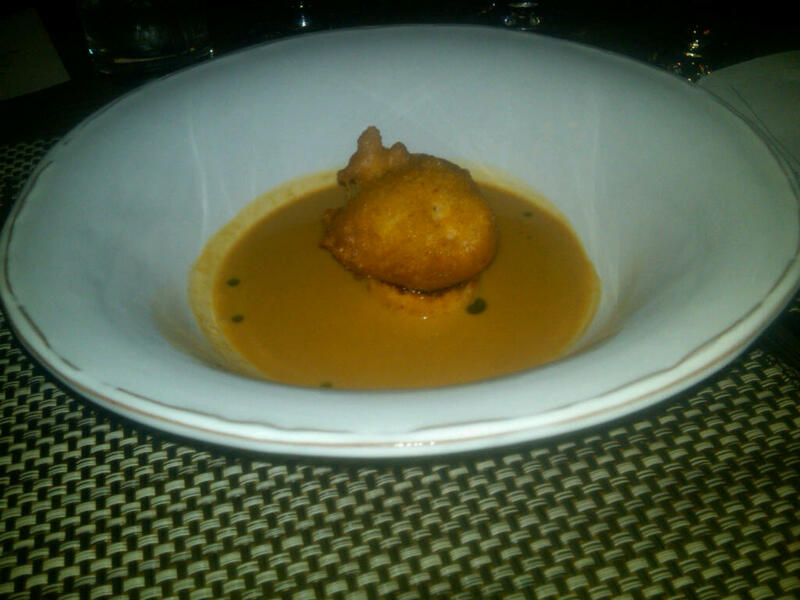 The crunchy hush puppy paired perfectly with the richness of the soup. Sitting under the hush puppy was a play on a scallop–a scallop-shaped shrimp and scallop cake. I’m not generally a big shrimp fan but this soup was just so rich, yet not too heavy for a first course. I loved taking little bites of the hush puppy and shrimp/scallop cake in a spoonful of bisque. In fact, this is the first time I’ve had scallops since Scallop-gate 2004 when I got a serious case of food poisoning the night before the Eagles played in the Super Bowl. 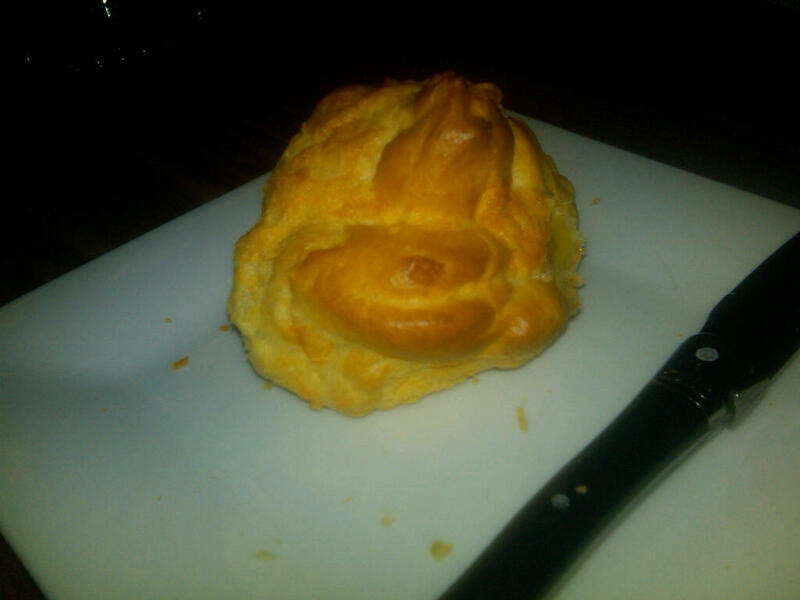 Between courses, they delivered a hot gougere that I dove into with its light and buttery richness. So tasty! We opened the White Burgundy Corsin Saint Veran 2008 to pair with the upcoming courses. I was a little nervous about this one. I’ve never had snails before and I can’t say that they were even on my list of new foods to try. In the spirit of the evening, however, I wanted to try everything. I was quite interested in this presentation–Snail Caesar, Burgundy Snails, Braised Lettuce, Parmesan Crisps, and Garlic Toast. 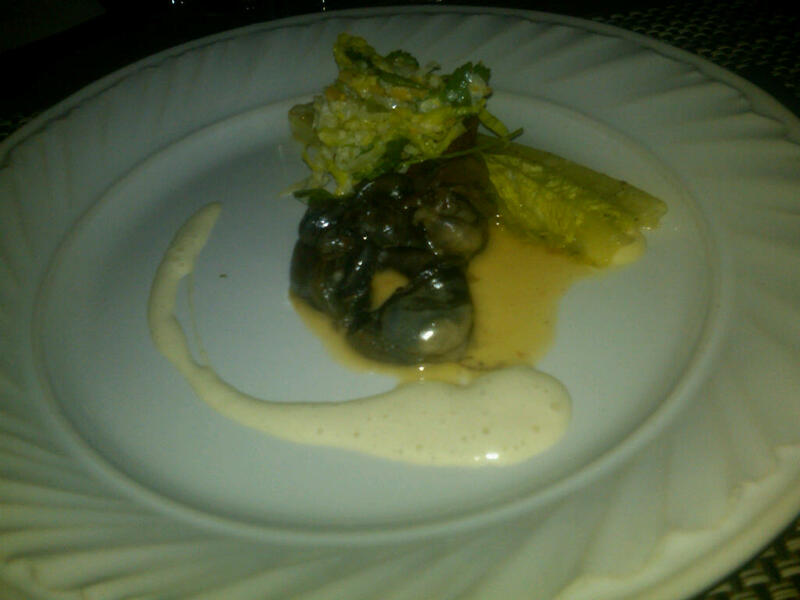 The snails were chewy and almost had the consistency of mushrooms with no real distinct flavor. They were a bit sandy at times. In all, they were kind of just there. I was glad that I had the opportunity to try them, but they definitely didn’t wow me. I enjoyed the braised romaine and smear of Caesar foam along the side. The White Burgundy paired nicely–it had rich hints of Chardonnay with touches of butter but no heavy oakiness. It drank like a red. I don’t know much about French wines, especially from Burgundy, but this one certainly piqued my interest. 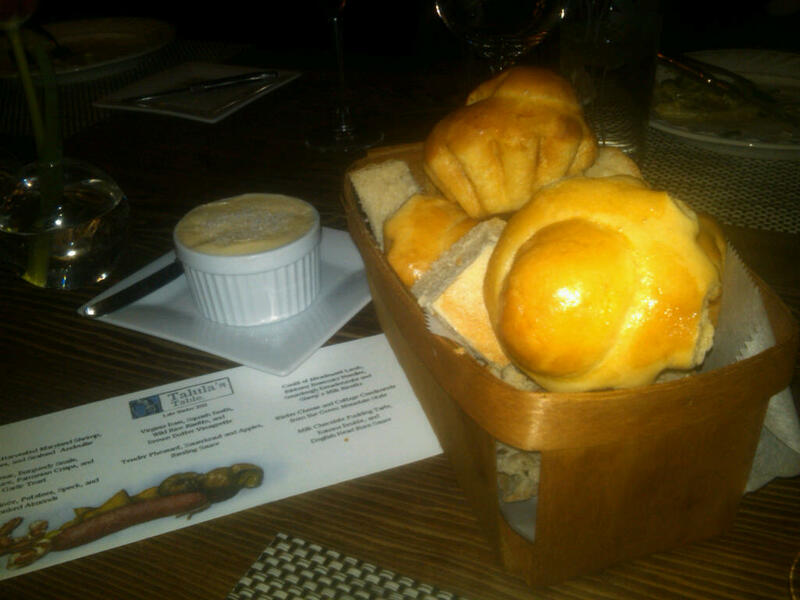 Then the bread baskets were delivered with local butter, sprinkled with sea salt. I didn’t really need bread, but I grabbed a flowery-looking brioche roll and smeared it with salty butter. 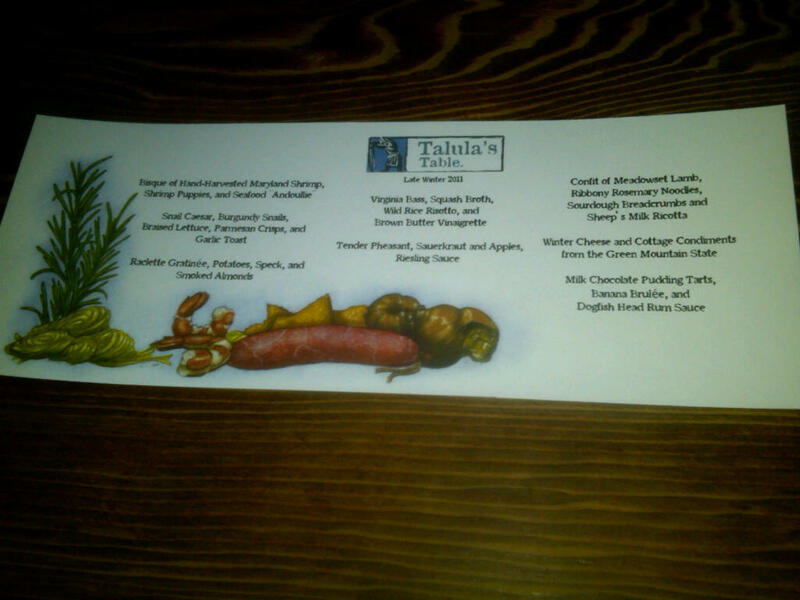 Hey, you’re at Talula’s Table, ya gotta try everything. 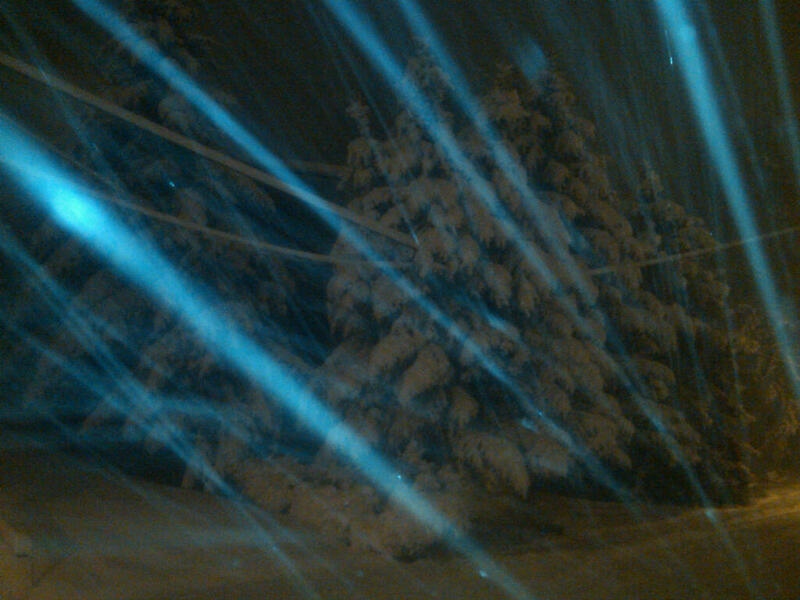 It was still snowing pretty hard at this point. 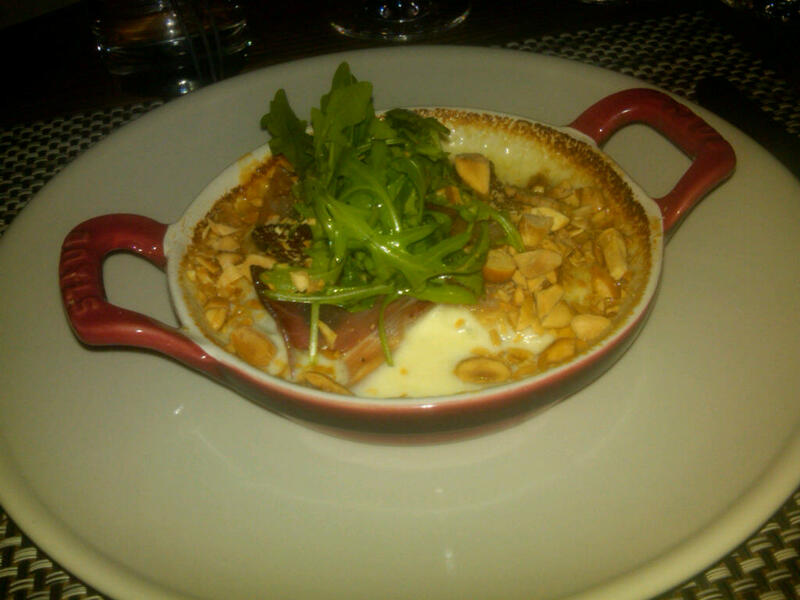 Things started to get a little heavier with the Raclette Gratinée, Potatoes, Speck, and Smoked Almond served in individual gratin dishes and topped with a lemony arugula salad. I’m a cheesy kinda gal and this was one of the dishes that I had been most excited about. The gratinee was creamy and cheesy with big chunks and potato. The dish was gratineed, of course, and topped with healthy slice of speck and the smoked marcona almonds, along with the arugular salad. One thing that would have made me like this dish better was if the potatoes were either sliced thinner or cut into smaller chunks. They used very starchy (she said Yukon Golds) potatoes and the big chunk did not allow each bite to incorporate a little bit of everything. I remedied that by cutting the potato and everything else into tiny pieces so that each bite offered a taste of everything. Wow, that speck was full of salty goodness and huge flavor. The marcona almonds were subtly smoked and they added a great crunch to the creaminess of the rest of the dish. I love a good crunch! 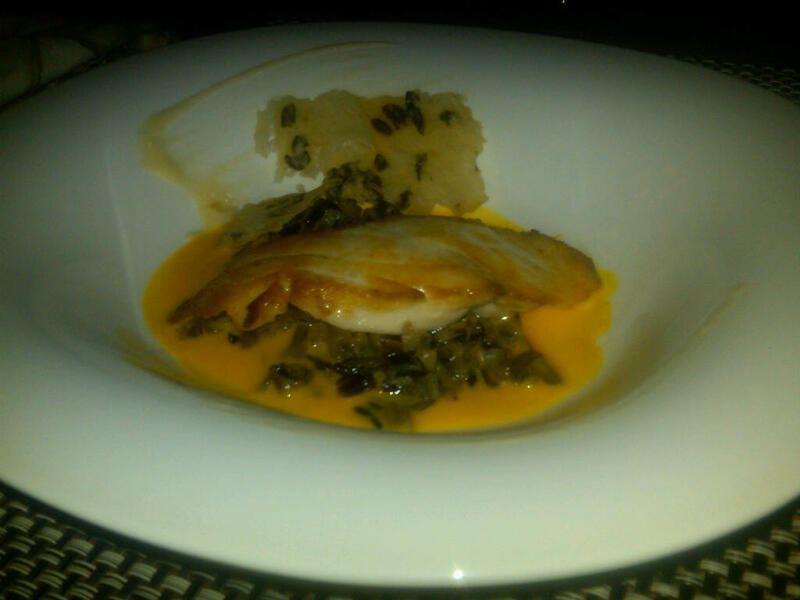 From there, the meal continued to progress nicely with our first, and lightest, protein dish of the evening, Virginia Bass with Squash Broth, Wild Rice Risotto, and Brown Butter Vinaigrette. We also moved into our first red, a Clos Julien Pinot Noir 2008. The wine was tasty (I liked all of our wines) but I kind of lost my memory of it with all the other wines. It was quite drinkable and light, as to be expected with a Pinot Noir. I liked this dish a lot. The bass was perfectly cooked and the broth added a nice wetness to the dish. I loved the crunchiness of the wild rice risotto, which is surprising, because I don’t usually like wild rice. Somehow they made it work because the crunchiness imitated the al dente-ness of a risotto. I also enjoyed the subtle hints of butternut squash in the broth. It wasn’t an overwhelming flavor, rather, my taste buds found the flavor every once in a while throughout the dish. On the side was some sort of crisp with some pieces of wild rice baked in. It reminded me of a rice cracker but I was in the bathroom when the dish was presented. The story of my life. It was around this course that we heard the news “all public and parochial schools are closed tomorrow.” The table lit up with excitement as over half of us had just learned that we had the day off! I was especially impressed by Molly’s snow day appreciation dance. Perhaps she’ll reprise that one at her wedding in a few months. 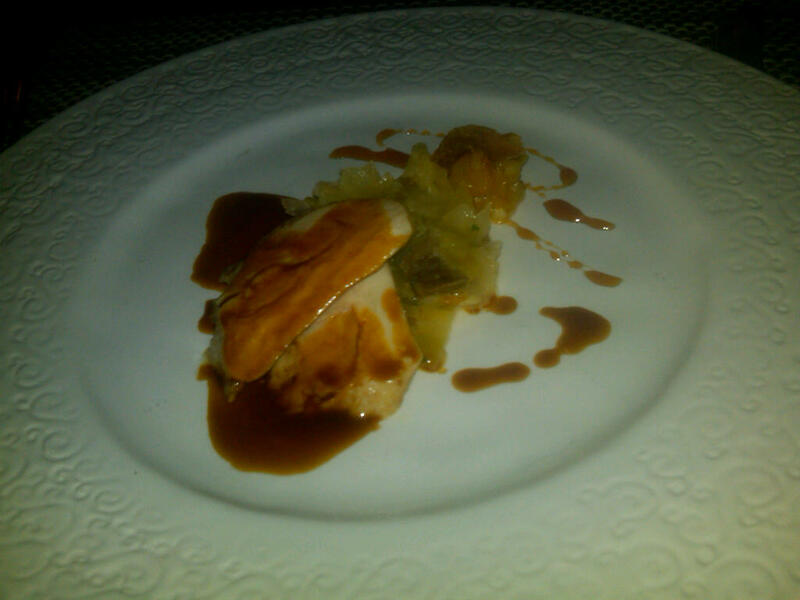 Next up was Tender Pheasant, Sauerkraut and Apples, Riesling Sauce. They were not kidding about the “tender” description. I’ve never had pheasant and it tasted like a slightly richer and meatier version of chicken. As simple as it is, poultry can be difficult to cook to perfection because the margin of error from perfectly done to overdone and chewy is slim. The pheasant was perfectly fork tender with a nice, chewy richness. I also love, love, loved the tanginess of the sauerkraut and apples, which was balanced perfectly by the sweetness of the Riesling sauce. That sauce was so rich that I never would have guessed it came from the under-appreciated Riesling. I can only imagine how much butter was in it! This dish was really exciting and packed with flavor and texture. Our final protein of the night was one of the other dishes that I was extra-excited for! 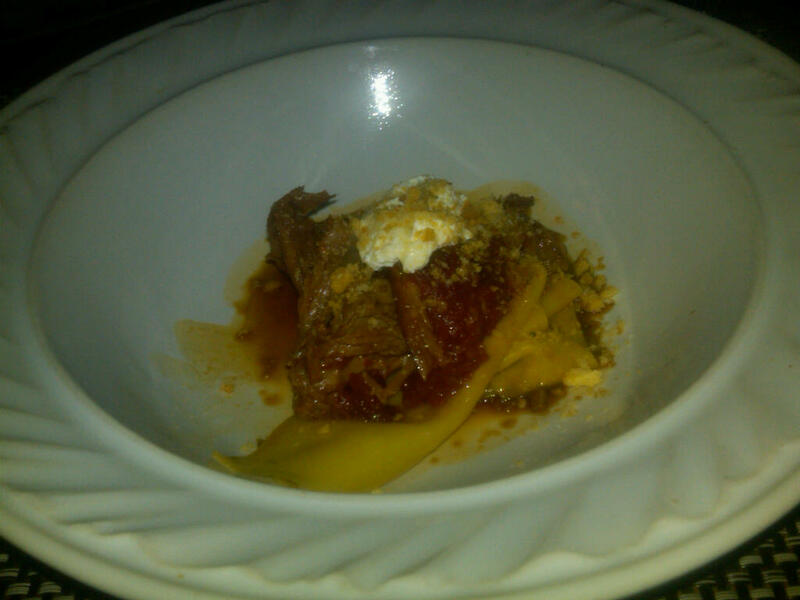 Confit of Meadowset Lamb, Rosemary Fazzoletti (wide ribbons of pasta,) Sourdough Breadcrumbs, and Sheep’s Milk Ricotta. I did get a little nervous after our whole sheep spotting incident, but forgot about it as soon as I dug in. I mean, c’mon, look at the description! Lamb confit?!? We also opened our richest and heaviest wine of the night, Quinta de Quietud Quinta 2005, a Spanish Tempranillo. The confit was reminiscent of a duck braise and had nice shreds of chewy, flavorful lamb. This is the type of food that my husband and I love to cook at home (although Talula’s did it better, of course.) I enjoyed the creaminess of a slightly thicker scoop of sheep’s milk ricotta perched atop the dish. I know the picture doesn’t do it justice but just believe me on this one–this dish was hearty and filling without being too heavy towards the end of the meal. It was phenomenal. The cheese plate–Winter Cheeses and Cottage Condiments from the Green Mountain State–had an interesting variety of cheeses that I’ll try to remember here, even though I just realized that the notes I took on my phone are long gone. 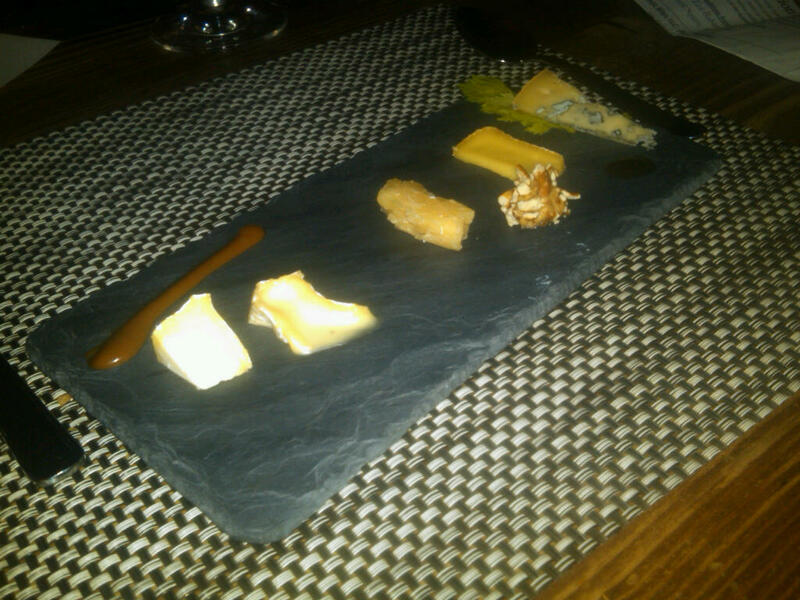 The first two cheese were soft, creamy varieties, one of which had an aggressively pungent flavor. It’s kind of like you couldn’t even tell if you liked it so you kept eating it–with the smoked chocolate smear on the side, of course. The middle cheese, a Vermont cheddar (all of the cheese were from the Vermont area–apparently that’s the Green Mountain State?) was crumbly without falling apart in my fingers and had the cheddary tang with a smooth finish. I don’t remember the fourth cheese, but I do remember that we were supposed to eat it with the pretzel and peanut butter ball on the side because it apparently pairs well with bacon and the flavors of the pretzel and PB bring forth bacon. The blue cheese was served with a splash of maple syrup from Vermont, of course. It was subtle and easy to eat. Again, it was a firm cheese without a serious tendency to crumble. Let me catch my breath for a moment. We’re still going!! To go with dessert, they poured our final bottle, La Cosecha Moscatel. I’m a huge fan of sherries and other dessert wines, so I was extra excited for this one and it did not fail me! 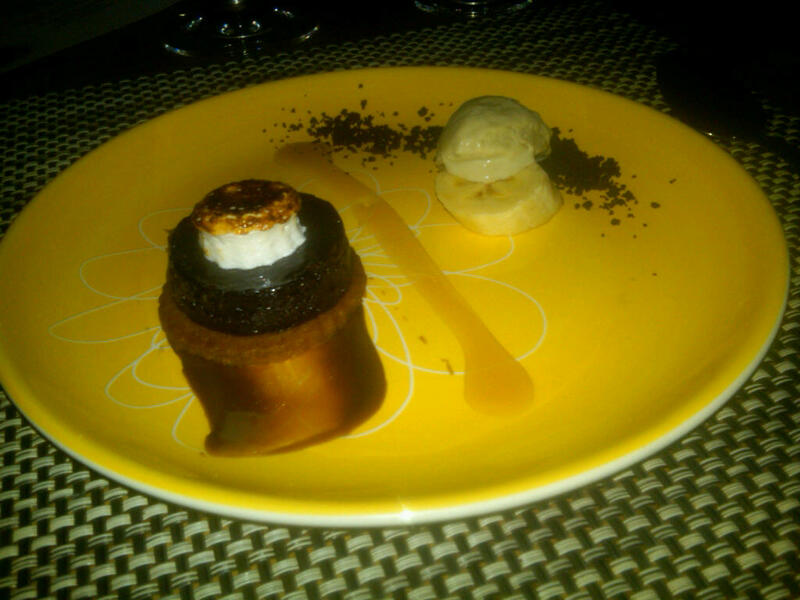 The final course of the night was Milk Chocolate Pudding Tart with Banana Brulée, and Dogfish Head Rum Sauce. This dish was fun and playful with a scorched marshmallow atop the pudding tart, atop a crisp cookie. Bananas are one of my most-hated foods (I’ve tried, I really have. I WANT to like bananas but just can’t do it) so I stuck with the left side of the dish. The housemade marshmallow and pudding tart were a perfect match–a little sweet, a little sticky–yet the cookie didn’t quite work for me. I wanted to cut into the whole dish to get a little bit of everything and the cookie was to crisp. I ate the other items off of it and then picked up the cookie and ate it by hand–which ended up working well for me. The Dogfish rum sauce was rich and awesome and added a punch of flavor to the dish. 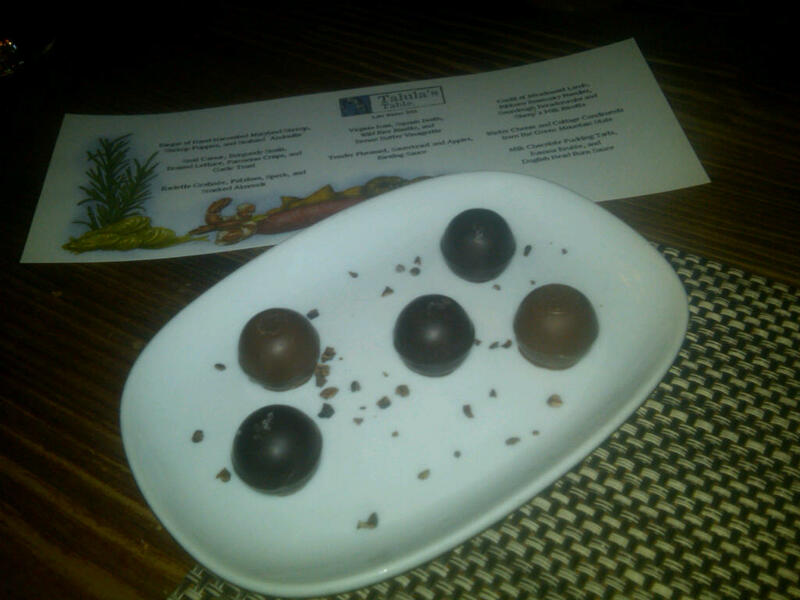 We thought dinner was over but alas, they brought some chocolate caramels–dark chocolate with sea salt and milk chocolate and pear. My husband and I split one (isn’t it cute when married people do things like that?) It was rich and gooey with the best caramel I’ve ever eaten. I’m not gonna lie–we had about 3 or 4 leftover chocolates and I put them in a ziploc bag that had been in my purse since a recent cookie swap during the holidays. My friends made fun of me and even accused me of being like my grandmother (her escapades deserve a post of their own, but let’s just say she’s poured many a food item into her purse.) I was just trying to help out and thought we could have the chocolates back at the hotel. Haters. Anyway, our check finally came. I even took a picture of it. I mean, seriously, everything about this meal was TOO CUTE, down to the check. 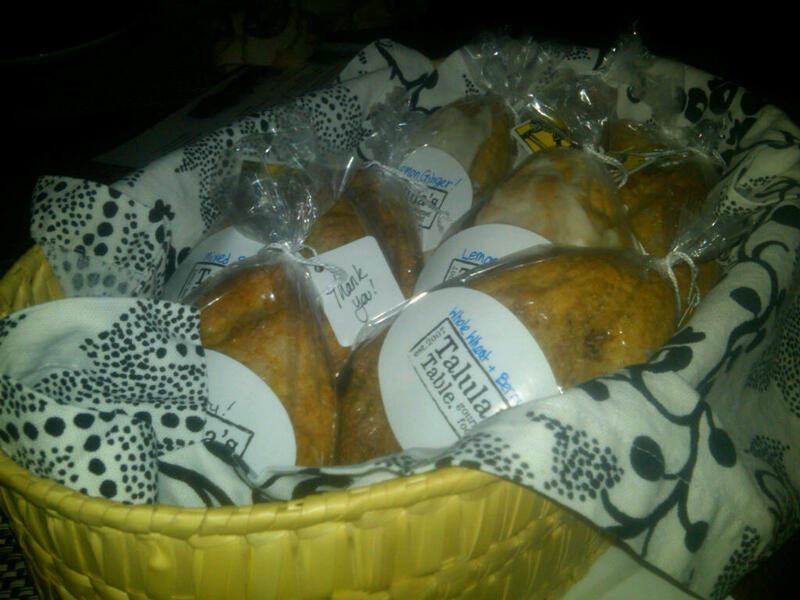 With the check came a basket of house made scones “for breakfast in the hotel tomorrow.” Adorable! We passed it around and I got a lemon-ginger one. Suzanne got the same one and snagged a photo. Then came the interesting part. We headed out of the cozy, welcoming doors to the height of the snow storm. After a harrowing walk involving a lost bottle of wine (the bag broke and I didn’t hear it fall,) a few slip n’ falls and Tre’s close encounter with a snow plow–with a side of absolutely stunning scenery–we made it back to the hotel. I can’t even imagine what the front desk folks thought when they saw nine abominable snowmen walk through their front doors as it neared the witching hour (well, seven, because we lost Molly and Terry for a short time.) We went upstairs, cracked a bottle of wine, chatted for a bit and feel soundly asleep. The following morning, we sloooowly awoke and made our way downstairs for the complimentary breakfast. If I didn’t say it before, I was surprisingly pleased with our hotel. They had a nice lay out of bagels, English muffins, cereal and even an oatmeal bar! They had pre-made (not in house) quiche and Jimmy Dean sandwiches to be heated up in the microwave but we steered clear of that… We made ironic comments about our breakfast spread compared to the previous night’s gastronomic experience but it satiated us sufficiently (all I needed was carbs and coffee!) The guys headed back into town to pick up the other cars (well, they made it most of the way until they encountered a steep hill that our 2 wheel drive couldn’t handle) and we were on our way. Despite the horrible roads, we made it back to Philadelphia in one piece (mad props to the Chester County Office of Emergency Management.) By the time we bounced and slid our way down our tiny South Philly street, my sister had shoveled out most of the spot that we had preemptively saved–nothing wrong with that! The rest of the day consisted of important things like a nap and a movie along with the consumption of my scone–PHENOMENAL! 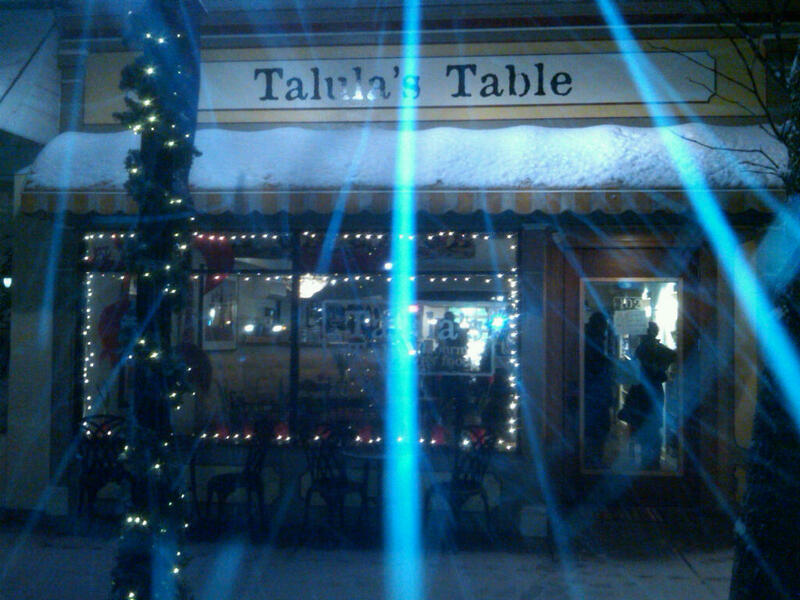 Overall, Talula’s Table is an experience in and of itself, but the snowstorm added yet another layer. It was great to be with such a fun group of friends who enjoyed eating, drinking and laughter as much as I do. Zoe, what a phenomenal posting! I’ve wanted to go there forever and I loved every single detail. 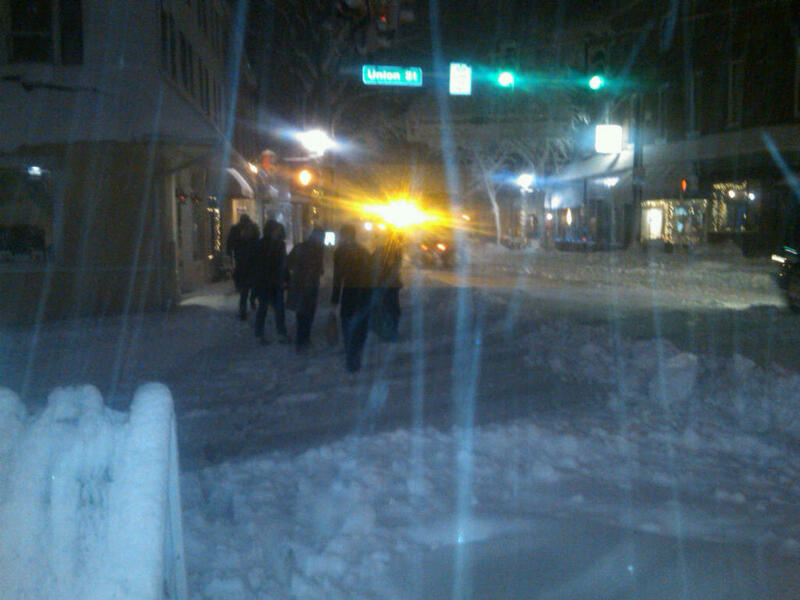 Next time, organize a dinner of the old farts and include us…snowstorm optional; hotel not. I love your blog! It was definitely a memorable meal, made even more wonderful by the great company. You captured it well Zoe! What a fun read! I was expecting it to end with a sleepover. It would be a lot more fun to be stranded overnight at Talula’s than at Philly International–or on a SEPTA bus, like some of those unfortunate drivers. What a wonderful account of your dinner and snowy travels. I agree with Chris. I want to go! 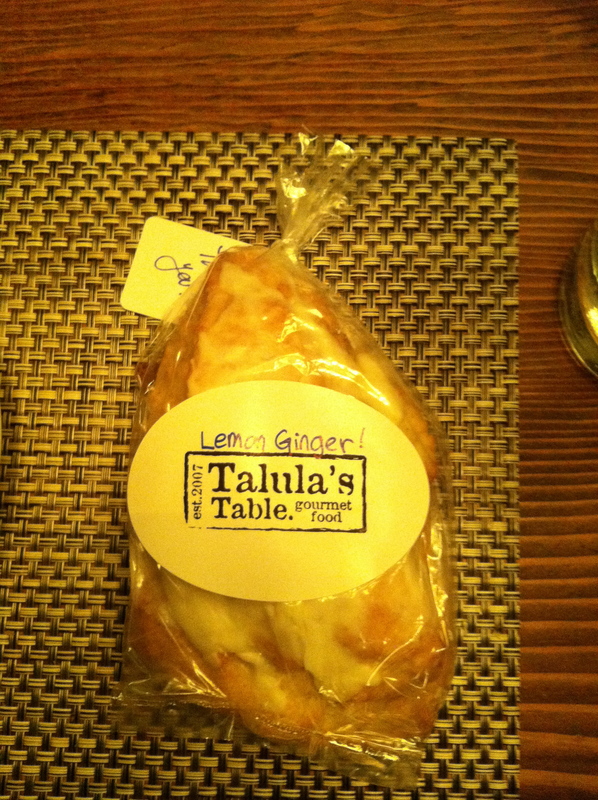 I definitely need to check out Talula’s sometime – what a memorable evening! what an amazing meal–from the food itself to the atmosphere and little goodies (truly the scones at the end are a great idea).. i’m salivating..